Halloween is almost here! 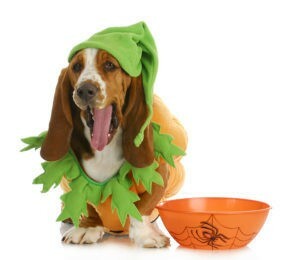 As you put together your costumes and pick up your candy, don't forget to plan for Fido and Fluffy. 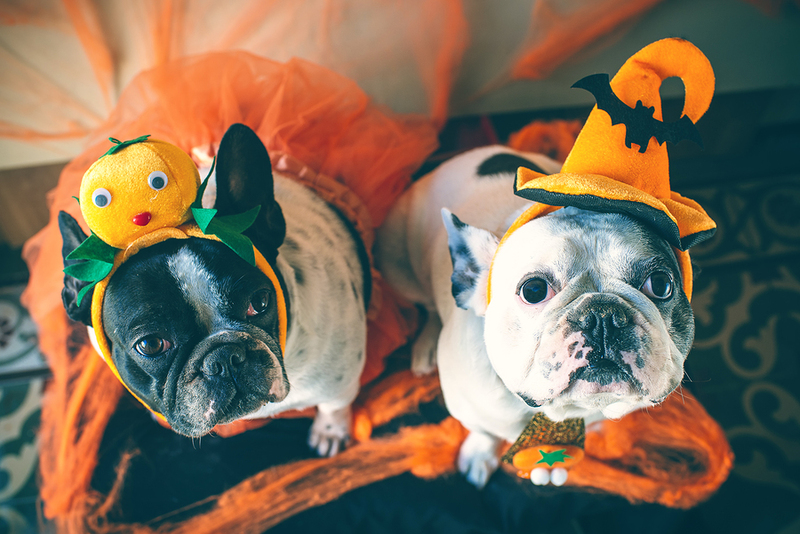 Halloween can be a scary and stressful time for our pets, so it's important that we take certain steps to ensure our furry friends have an enjoyable holiday too. Keep candy away from pesky paws! Many of our pets display amazing dexterity to reach those delicious sweet treats. Chocolate is toxic to pets and gum and diet candies are also toxic if they contain Xylitol. Xylitol can have fast, fatal consequences because it can cause a precipitous drop in blood sugar (acute hypoglycemia) and/or liver failure. It is easy to leave a pack of gum sitting out on the counter or on the car seat. So double check before bedtime to make sure that the candy and gum has been stored in a secure cabinet in all rooms! Watch out for Jack O'Lanterns and burning candles. Pets can easily knock them over and start a fire. Electrical cords can also be an easy chew toy for puppies. Be extra vigilant about keeping an eye out for your pet's location and activities. Keep all cats (particularly black cats) and shy, nervous dogs safely inside a room away from your Halloween festivities. Doorbells and excited trick-or-treaters can be very scary to them. If your dog is happy greeting guests (and may even like to dress up! ), then be sure to hold her firmly on a leash when you open the door. Masks and costumes can be very confusing to pets. Even a very calm dog might snap if a scary figure in a dark costume rapidly approaches them and the dog feels threatened. Be sure all pets are fed and walked before trick-or-treaters arrive. This will ensure your night is less stressful and accident-free. Aurum Metallicum - Animals who would benefit have great hopelessness, grief, depression and hypersensitive to noises. The nervousness is better for these animals in open air. These anxious animals can have heart palpitations. They desire company or to be near their owners. Phosphorus - Animals who would benefit are reactive with intent on getting away from a situation, not to do harm. Thunder, lightning and loud noises almost always startle these animals. Dogs that do well with Phosphorus are also those that leap suddenly if you drop something. Cats will leave tracks on your leg when something is suddenly dropped and they react to the loud noise. The typical Phosphorus patient is quick, fearful, and nervous. Borax - This remedy is often useful for animals that are startled from firecrackers and gunshots with the noise being some distance away that induces extreme anxiety. This patient has sensitivities to sudden noises which causes anxiety. They are easily frightened and have fear of thunder. These animals are worse when coddled or “rocked” and better after 11pm. Aconite - This is the main homeopathic remedy that helps deal with shock. These are the animals that even after storms and fireworks still seem a bit overwhelmed. It can also be used for other outsides stressors, chills, or sudden and dramatic changes in weather when they over-react. The symptoms of the Aconite type are usually overly dramatic than they need to be after these situations. Great anxiety and fear in the patient, that “deer in the head lights” look is a key indicator that this remedy would be best. Tranquility Blend - This essential oil blend from Rocky Mountain Oils is comprised of orange, tangerine, patchouli, lime, ylang ylang, lavender, blue tansy, german chamomile and citronella. This blend has a soothing effect that allows our pets some instant calming. This mix helps to ground our energy while helping to reduce depression, ease anxiety, stress, and tension. It helps bring a feeling of joy to the heart. It balances and stabilizes the emotions, gives patience, and calms worries. You can see why we would recommend this to our animals during a time of high stress. Lavender - This universal oil is mostly known to help calm our worries and fears along with many other attributes. However, not everyone or every animal likes or appreciates the smell of lavender. This single essential oil is recognized for calming because of its ability to help rebuild the myelin sheath of the nervous system by helping rebuild the nerves while quieting frayed nerves. QuietScent - This delicate blend from BeYoung Essential Oils helps to diminish the neuro chatter that is associated with fear and anxiety. It allows the mind the calm in order for rest to take place and mental clarity to be on the forefront. This blend also helps the muscular and nervous system to overcome stressed muscles and high-strung nerves. Balance - This blend from Rocky Mountain Oils is beneficial in reducing stress and generating a feeling of well being, relaxation and peace. It is a blend of Hyssop, Lavender, Lemon, Orange, Geranium, Rosewood, Sandalwood, Myrrh, Sage, Spruce, Frankincense, Rose Otto, German Chamomile, Ylang Ylang Extra, Neroli and Angelica. The grounding effect from this combination allows for emotional and physical healing. Distress - This formula is a combination of Bach Flower’s as well as North American Flower remedies. The color white is associated with this formula with the representation of our natural state of “light” or to be “enlightened”. It brings about the emotions of happiness, inner peace and love. White contains all the color vibrations within. These feelings of content are what we aim for when our pets are emotionally balanced and centered. Distress remedy is best when used in traumatic situations, eases stress, and promotes self-awareness. This blend contains the rescue remedy formula of clematis, impatiens, rock rose, cherry plum and star of bethlehem. What makes this blend unique is that is has two additional flower remedies of arnica and red clover. Be Courageous - This formula is a combination of Bach Flowers as well as North American Flower remedies. Along with the combination of flower this remedy has the color yellow associated with this blend. The emotions associated represented with yellow are uncertainty, fearfulness and scared emotional states. The Be Courageous formula from Nature’s Sunshine allows us to face our fears while balancing our fearful emotional state. It aids in the feeling of courage, self-confidence and self-reliance. It also allows those to trust in their own judgement. This formula contains mimulus, scleranthus, cerato, blackberry and red clover. Star of Bethlehem - This Bach flower is mainly known to help ease physical, mental and spiritual traumatic experiences. This remedy helps to restore the self-healing mechanisms of the body by allowing us to deal with trauma and rebalance our emotional state left behind from our experience. Many times the trauma may be stored within our being and may be a fear from birth. Star of Bethlehem restores mental, emotional and physical calmness. Rock Rose - The initial personality of a Rock Rose type often feels under the acute threat both mentally and physically. Those in a rock rose state are often dramatic even though the outside circumstances are not as threatening as they make it appear. The rock rose animal is often in a state of fear, terror and panic. Rock rose helps to restore courage, bravery and calmness to the animal. If they are too worked up and in a state of panic, you can mist the remedy into the air around the animal rather than attempting to administer it orally. Herbsmith Calm Shen - This combination of Chinese herbs calms the spirit and harmonizes the heart and kidney while preserving your pet’s unique vitality. Chinese theory considers anxious behavior to be a disharmony within the body and elements. In a healthy dog, the heart, a fire element (yang), and the kidney, a water element (yin), are balanced. Excessive emotional or physical stress and aging can diminish normal kidney function, which leads to the inability to control heart shen and subsequently allows nervousness to occur. Anxious behavior may also occur due to an imbalance of the heart itself. The herbs in Calm Shen are specially combined by Dr. Chris Bessent to support normal kidney function and tonify heart yin and blood, thus calming the spirit. Calm Shen is used best when your pet is exhibiting nervousness, hyperactivity and discontentment responding to environmentally induced stress. This supplement should be given prior to stressful holiday fireworks to allow the body to rebalance over a period of time to help with the anxiety and stress. GABA Plus - This amino acid is necessary for those animals with high anxiety. It helps to prevent nerve cells from over-firing and balance neurotransmitters by improving circulation to the brain. This Nature’s Sunshine product incorporates passion flower which is an herb known to soothe nerves and support the nervous system. It can help reduce stress, anxiety and depression and is helpful with brain synapses. When under prolonged stress and anxiety, the brain exhausts all the available GABA and other inhibitory neurotransmitters, thus allowing anxiety, fear, panic and pain to attack you from every direction. The ability to reason diminishes leading to a fight or flight response. Essential Fatty Acids - Eating the right kind of fats can also help us and our animals during prolonged periods of stress and anxiety. We need fat for proper function of our brain but now-a-days it isn’t uncommon for us to consume the wrong kind of fats such as processed vegetable oils and conventionally rendered animal fats. Order here. Kali Phos Cell Salt - This simple and inexpensive tissue salt may be enough for pets with less severe cases of anxiety and nervousness. When there is a deficiency of Potassium (Kali) Phosphate (Phos) within the body, the mentals affected are bashfulness, anxiety, fear, tearfulness, suspicion, weak memory and depression. It also supports the vasomotor nerves, sensory nerves, sympathetic nerves and motor nerves This tissue salt also governs the solar plexus which is considered our “second brain” or the epicenter of our nervous debilities. Order here. Cranial Sacral Therapy - This light therapy touch works with the tissues around the sacrum, along the spine and around the bones of the cranium. The light touch facilitates movement to help assist the body in release of overall tension, improved nerve flow and optimal production and reabsorption of the cerebrospinal fluid. The cerebrospinal fluid is known to bathe and nourish the brain and nerves feeding into the spinal column. When animals are continually in a nervous mode they become stuck in “flight” mode. This therapy helps by untucking the tailbone which happens when we are in a “fight or flight” mode. The release of the sacrum can bring the body’s energy back into balance. Call The Pet Beastro at 248-548-3448 to schedule an in store session for this therapy in our Madison Heights, Michigan location.